Can’t make it to our Reverse Raffle? You can still get in on the fun! We’re giving you a chance to buy some of our awesome Cleveland sports items now. Check them out below, and click the ‘buy it now’ button to purchase them now online. * Your generosity will help us directly benefit the dogs of the Cuyahoga County Animal Shelter. 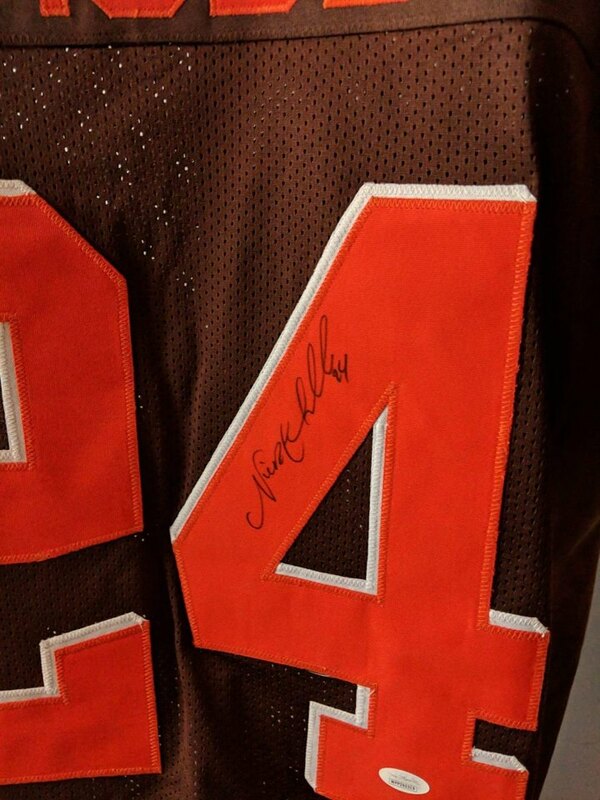 Each item was supplied by GPS Sports in Rocky River, Ohio, and includes a certificate of authenticity. There is only one of each item available under the Buy It Now option. Not all items can be shipped. For those that can’t, we will contact the buyer after their purchase to make arrangements. Feeling dangerous? 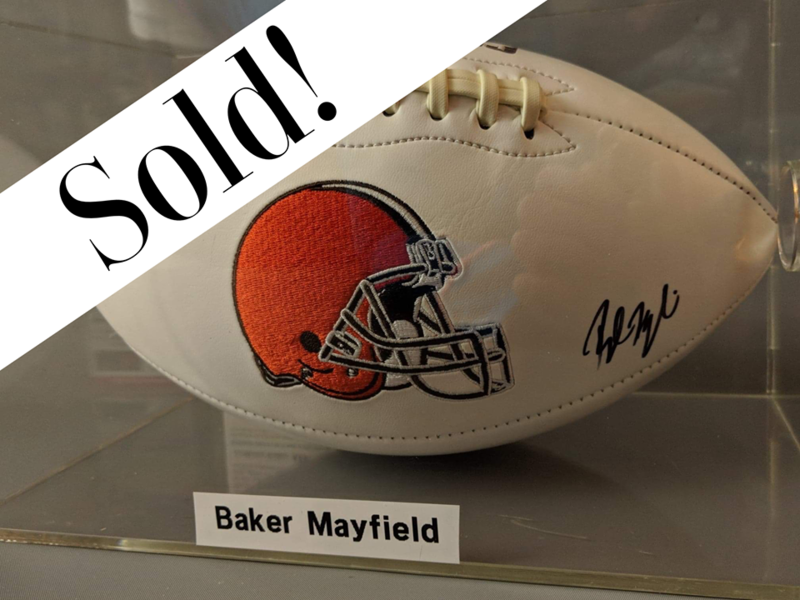 This football was autographed by Browns quarterback Baker Mayfield! He was drafted first overall in the 2018 NFL Draft. And in his first game, he led Cleveland to their first win in 19 games. Overall, he threw 27 touchdowns, breaking the rookie passing touchdown record. He was runner-up for NFL Offensive Rookie of the Year and was named Cleveland’s top professional athlete at the Greater Cleveland Sports Awards. 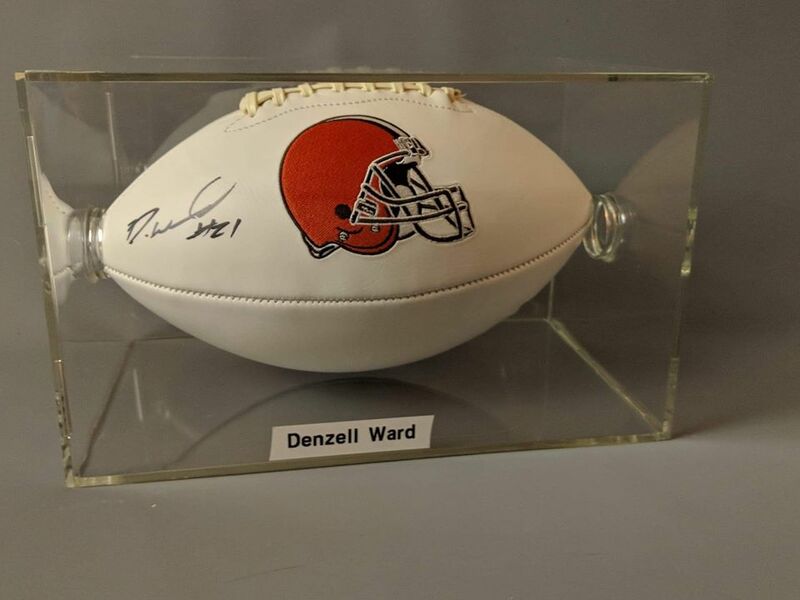 Browns cornerback Denzel Ward was selected in the first round of the 2018 NFL Draft, becoming the highest selected cornerback from OSU since 1997. He went to high school in Nordonia and graduated from Ohio State. He was voted to the 2019 Pro Bowl and was nominated this year for the Professional Athlete of the Year Award at the Greater Cleveland Sports Awards. This autographed football comes with a certificate of authenticity. Indians outfielder Greg Allen last season batted .257 with 20 RBI and 21 steals in 265 at-bats. Allen played almost every day in the final two months of the season, hitting .297 with 22 strikeouts in 133 plate appearances and an OPS of .770 across 44 games. These items come with a certificate of authentication. Indians outfielder Greg Allen last season batted .257 with 20 RBI and 21 steals in 265 at-bats. Allen played almost every day in the final two months of the season, hitting .297 with 22 strikeouts in 133 plate appearances and an OPS of .770 across 44 games. These items come with a certificate of authentication. Running back Nick Chubb was selected by the Cleveland Browns in the second round (35th overall) of the 2018 NFL Draft. He saw about 18 carries per game last season. In November’s game against the Atlanta Falcons, he broke off a 92-yard rushing touchdown to help secure a 28-16 win. The run was the longest rushing touchdown in Browns franchise history. 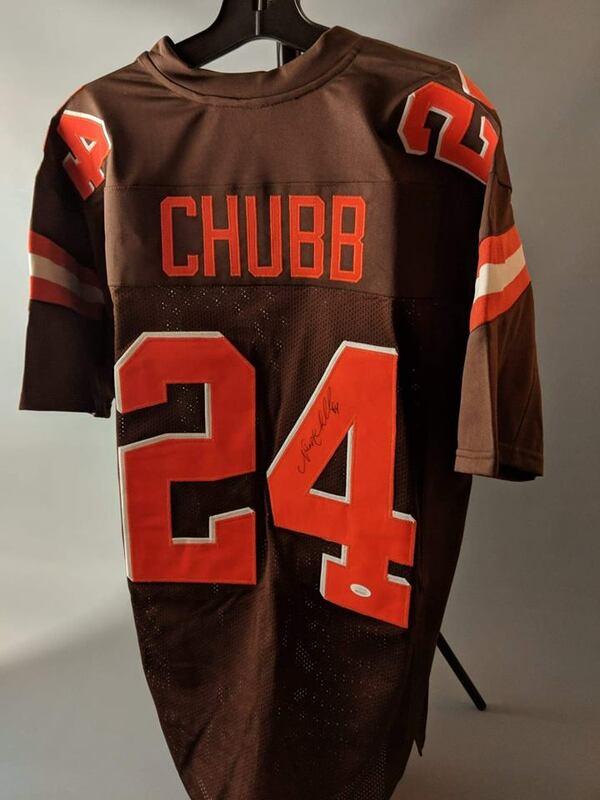 This jersey was autographed by Chubb and comes with a certificate of authentication. Ohio Stadium, otherwise known as The Shoe! 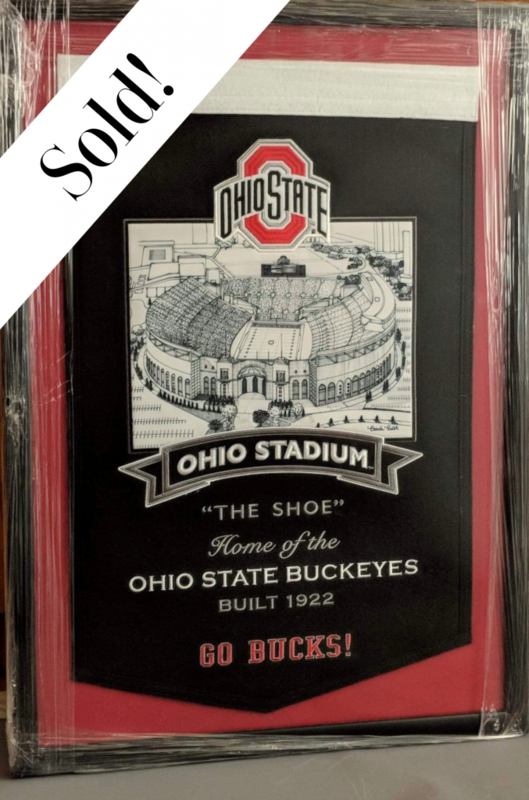 This framed banner would be perfect for any Buckeye fan to put on display. This item cannot be shipped. 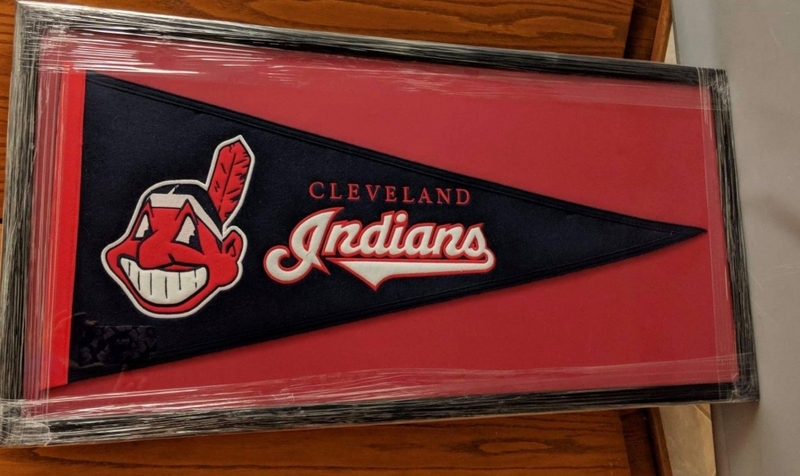 The Chief Wahoo logo was created in 1947 and is being phased out of Tribe items and uniforms with the start of the 2019 baseball season. Get a last chance to display the logo with this framed pennant! This item cannot be shipped. *All sales are final. The receipt you receive after purchasing an item is a binding purchase agreement with FCCAS. 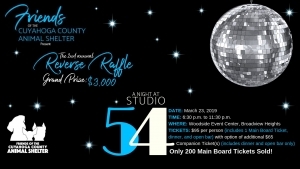 To learn more about our A Night at Studio 54 Reverse Raffle event, click here.